Let’s be honest – soil fertiliser isn’t popular or hip. It’s probably the last thing you want to chat about over a beverage. So it comes as no surprise that soil fertilisers very rarely dominate debate at dinner parties. 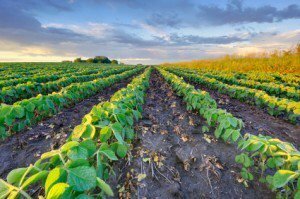 The phosphate market is undergoing a transformation. This has opened the door for a terraforming of the phosphate market by virtue of it shifting from being producer dominated, to becoming consumer driven. We think one particular ASX-listed company is primed to benefit. It’s Potash West (ASX:PWN) – who has a long-term ambition to become a boutique fertiliser supplier by initially taking flight via the production of 400,000 tonnes per annum of single superphosphate (SSP), and using that revenue to develop hyper-efficient potash production technology (K-Max – more on that later) that could help terraform the entire potash industry. Now, this is speculative – PWN have a few more hoops to jump through before production begins, so please do your own research before choosing to make an investment in this stock. In other words, PWN has chosen a strategy of producing SSP first, in order to generate the required cash flow to build a $600M K-Max processing facility – for the production of potash. Over the past 30 years there has been a significant reduction in the number of SSP production facilities, with plants now in Geelong, Portland, Kwinana and Hobart. With this downturn in Australia having occurred, PWN could realise their boutique intentions and have a strong foothold in Australian fertiliser supply. PWN’s long-term ambitions are fuelled by strong global exploration assets and a ground breaking technology known as K-Max, which enables them to produce phosphate and high grade potassium sulphate (potash) from hard rock waste materials and therefore take exploration out of the equation. The concern over the most prominent phosphate monopolies on earth, Morocco which holds +60% of the world’s phosphate reserves and Saudi Arabia, could see power shifted away from these regions. Currently, phosphate producers negotiate sale prices directly with buyers without a centralised marketplace or standardised unit measure. However a shift in sentiment away from the market’s current duopoly, should open the door for other players. 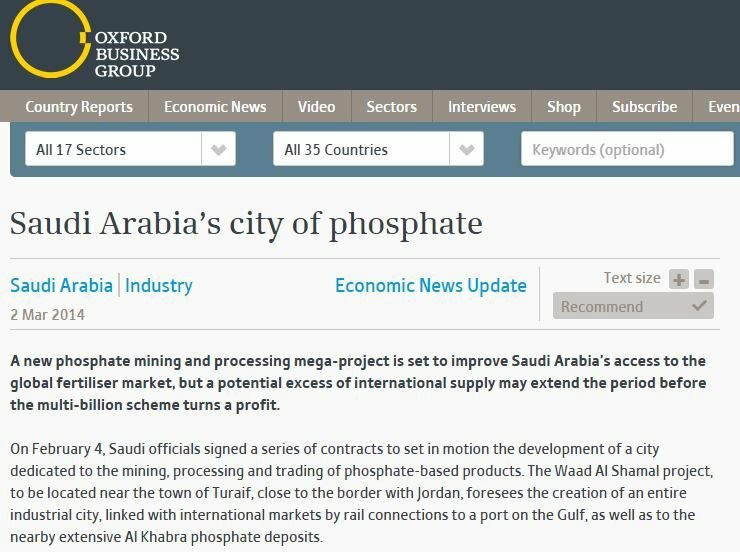 So although there is still a long way to go with Morocco and Saudi Arabia continuing to dominate the phosphate market, there is hope for others. In fact many pundits are concerned about the concentration of phosphate supply in such a volatile part of the world as Morocco. In many ways, what is currently happening in the phosphate industry closely resembles what happened to iron ore around ten years ago. A de-facto cartel was disbanded which saw lower prices and more competition. Therefore, the future phosphate industry is likely to have a more efficient price-setting method and quite possibly, become market traded to allow end-users to pay spot prices rather than pre-agreed long-term arrangements. That’s what happened with iron ore. In light of this, Potash West (ASX:PWN) is a company that is aiming to become one of Australia’s most dominant SSP suppliers, and it’s following in the footsteps of ASX listed Incitec Pivot (ASX:IPL) which is capped at $6.37BN and the $161.8M capped CI Resources (ASX:CII). PWN is busy bringing all the important aspects online in order to become a supplier of around 400,000tpa of single superphosphate (SSP) into the world market within the coming two years. It hopes to be a part of a new, more-efficient framework that is likely to be based on competitive advantage, lowest cost to consumer and innovation. By starting off with supplying SSP, PWN plans to generate enough cash flow to develop a state of the art K-Max processing facility by 2023 that could revolutionise phosphate and potash production forever. Technology is re-forging the world in its own image, and it will likely forge a sustainable commercial path for PWN. In order to fulfil their long-term ambition to become a fully-fledged potash producer competing with the market’s major players including Potash Corp, Uralkali and Agrium, PWN has chosen a strategy to first produce SSP, in order to generate the required cash flow to build a $600M K-Max processing facility – for the production of potash. Once K-Max has been brought online, PWN will produce potash, phosphoric acid and alum, but for the time being, it’s focusing on phosphate fertiliser. Before we take a look at the different types of fertilisers, let’s have a quick chat about the difference between phosphate and potash and why PWN is producing SSP first. Phosphorous is a key macro nutrient in fertilisers, required to maximise plant growth and agricultural yields. Phosphorous deposits are widespread, but the export industry is dominated by the Middle East and North Africa, with Morocco holding over 60% of the world’s reserves. There is no substitute for phosphorous in maximising plant growth. 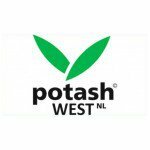 Potash, on the other hand, refers to a group of water-soluble potassium salts that are mined for use primarily in fertiliser production. Potassium is one of three key fertiliser ‘macro-nutrients’ essential for healthy soil and plant growth. It is generally used in combination with the other two macro-nutrients, nitrogen and phosphorus, to produce a range of fertilisers, the type used being dependent on the soil to which it will be applied. Such fertilisers must be used annually, since nutrients are depleted from the soil with the harvesting of crops. Thus, demand for these products is ongoing. SSP is used on pastures and when opening up new land – both critical elements for Australian farmers as they look to raise beef and sheep herds to meet the food demands of Asia. Therefore, PWN’s focus on SSP and then producing SOP potash makes complete sense. In a market where MOP potash is declining in popularity (and effectiveness), its SOP/SSP variant provides better results and can potentially fetch higher market prices. PWN is thus looking to commercialise novel, patented processing IP dubbed ‘K-Max’ which is a more efficient way of extracting potassium from glauconite. PWN will then be able to produce high grade potassium sulphate (potash) from glauconite, a form of mica. Micas have been dubbed as the ‘forgotten ore’ because they are typically thrown away by miners whilst exploring for other resources such as tungsten or tin. K-Max could be PWN’s ticket to long-term success. PWN’s K-Max technology is almost completely self-sufficient and considerably less resource intensive than the current status quo. At the same time, the K-Max technology is in the early stages of commercialisation, and PWN’s long term success is no absolute guarantee. It always good to consider a range of factors before investing in stocks like these, including your own personal circumstances. The K-Max technology was first developed with the help of PWN’s Non-executive Director, Gary Johnson who is also Managing Director at Lepidico. In addition to K-Max, which is 100% owned by PWN, Lepidico is also developing a parallel L-Max variant that produces lithium using similar technology. L-Max technology is being used by Lithium Australia (ASX:LIT) to recover lithium carbonate from lithium micas. Where LIT and Lepidico are running full steam ahead with L-Max, PWN is focusing on producing potash using K-Max. 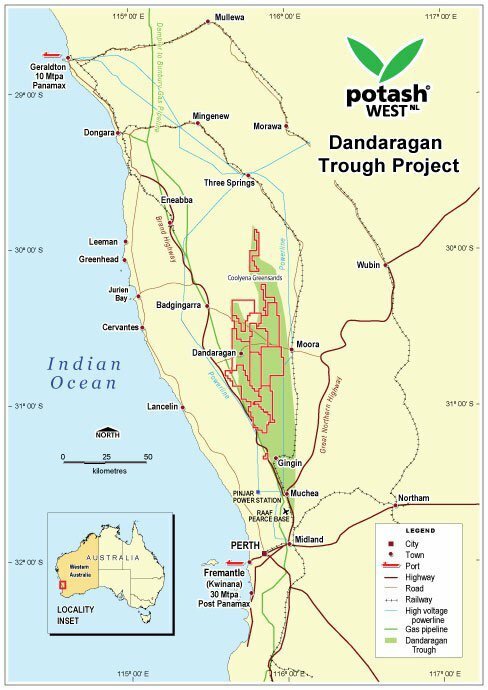 PWN has one primary project in the Dandaragan Trough in Western Australia and one joint-venture based in Germany, the South Harz project. PWN retains 100% ownership over its project located in the Dandaragan Trough in Western Australia. PWN has a resource of 250 million tonnes of phosphate ore. Mapped out below is the Dandaragan Trough shaded in green, with PWN licences outlined in red. 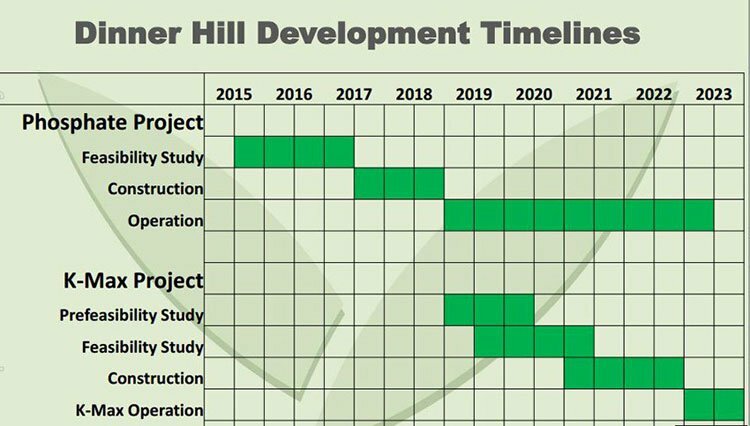 The most prospective part of the project is Dinner Hill where PWN recently had a Scoping Study updated. Tabled below is PWN’s Dinner Hill Scoping Study summary, with previous and updated figures. In fact, at Dinner Hill the Company has undertaken extensive aircore drilling resulting in the delineation of both phosphate and potash resources. Despite a global commodities slowdown that has seen potash prices fall sharply over the past five years, prices have now stabilised around the US$300/t (A$420) mark for MOP potash. This augers well for PWN’s long-term potash play. 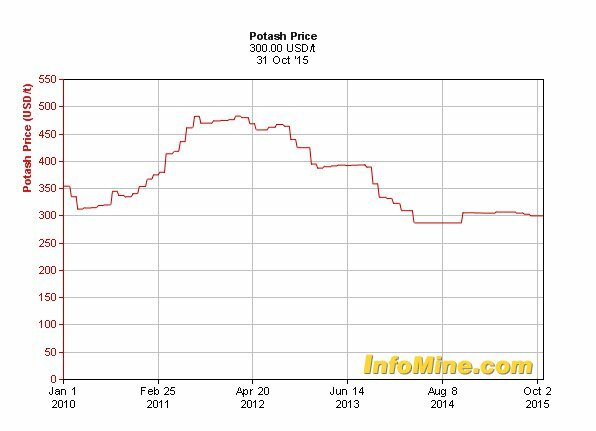 However – like all commodities, the potash price can fluctuate, and could go up or down by the time PWN gets to the point where it is actually selling it. Meanwhile the Dinner Hill project is factoring a production cost of around US$130p/t (A$200) and sale prices of US$225p/t (A$320), for single superphosphate. Furthermore, PWN should remain well insulated by low production and transportation costs, provided by Dinner Hill. It’s also very likely that once K-Max has been tested and integrated into PWN’s feasibility studies, PWN could see even greater project economics across all its projects, courtesy of K-Max technology. PWN’s long-term plan is to develop and build a fully operational potash production plant that utilises the cutting-edge K-Max technology 100% owned by PWN. PWN intends to utilise revenue generated from its application of existing technology to produce phosphate fertiliser, which can fund the development of a state of the art $590 million production plant before 2021. Stage 1: Simple superphosphate production using existing technology in order to generate early cash flow in order to finance K-Max development plus pay a return to shareholders. Stage 2: Implementation of K-Max to produce potash, phosphoric acid and alum. 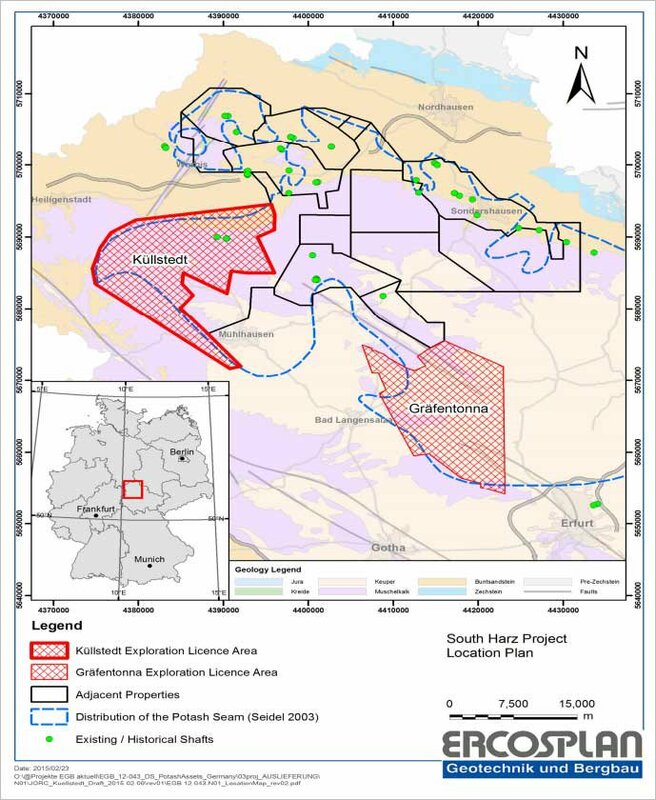 The South Harz project is split into two licenses with a combined area of 457 sq. km. in the heart of the world’s fifth-largest potash producing country – Germany. PWN owns 55% of a private company, East Exploration that owns the licenses. The South Harz project is very large, to say the least – it’s a 4-5 billion tonne potash exploration target, with grades of 7.2% to 25% K 2 O. In order to pursue both its Western Australian and German ambitions at the same time without splitting the bank, PWN has served up a tidy corporate manoeuvre which funds the project for drilling without PWN having to do any legwork themselves. PWN has vended 100% of the project into an IPO, of Davenport Resources, on schedule to occur in Q1 2016. By selling 55% of the project for a 28% stake in a funded, listed company, PWN effectively limits its exposure to the costs of further exploration at South Harz, but still retains almost a third of the potential upside. In addition current PWN shareholders will have a priority entitlement in what looks to be a keenly sought IPO. The world’s population is continuing to grow at a steady rate that doesn’t look like slowing anytime soon. At the same time, arable land for farming is dwindling. Soil fertilisers are helping to bridge the gap by making soil more productive and are already used to producer around 30% of the food we eat today. That number can only grow as the world’s population expands while the amount of arable land stays constant. The relationship between population growth, arable land and the subsequent difficulty for food production is creating a perfect storm for SSP producers such as PWN. And when we look at the market for agribusiness in Australia, it too indicates fertile ground for the foreseeable future. 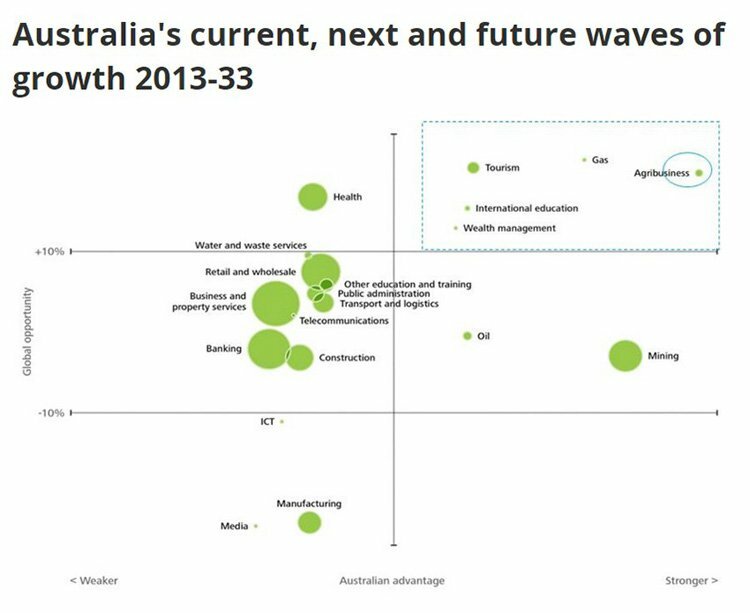 Scatter plotted below is the forecast growth for various Australian growth sectors going into 2033, published by Deloitte. Agribusiness is the strongest growth sector in Australia which is also coupled with a huge global opportunity for Australian exporters (farmers). All those farmers will be coming to companies like PWN for fertiliser products in order to attack international export markets in the years to come, and PWN is in prime position because its run-up to production is expected to take around 1-2 years. What does iron ore and fertiliser have in common? The shifts in fertiliser supplies echo transitions seen in other commodity markets, notably iron ore, according to Macquarie analysts Daryna Kovalska and Colin Hamilton. Like potash, iron ore was once dominated by a handful of producers and sold primarily through fixed-price contracts. Today, iron ore prices are tracked daily, and that information is typically used to negotiate sales agreements. Additionally, Australia has entered into three recent Free Trade Agreements (FTAs) with Korea, Japan and China, which will either phase out or significantly reduce tariffs on imports of Australian produce over time. Again, increasing the price competitiveness and improving market access of Australian produce. In relation to the China–Australia Free Trade Agreement (ChAFTA) signed in June 2015, Australia is already China’s third largest supplier of agricultural products after Brazil and the United States and the agreement has the potential to expand this relationship further – particularly important given the size and potential growth of the Chinese market. Once again, these factors increase the likelihood of more food being grown for export in Australia which is going to require more fertiliser. And it can all be sourced from Australian fertiliser producers such as PWN. If the potash industry goes the way of iron ore, it will be important to be resourceful and efficient in order to survive. Prices may be under pressure and could even fall further, but in the long-term, demand for fertiliser is almost certainly to rise as the world’s population continues growing and farmers increasingly turn to producing more soil intensive crops as part of a broader yield-focused future for agribusinesses. Therefore, the most important aspect in any free market is competitiveness, and PWN has it in spades. Here at The Next Mining Boom , we feel PWN is on the right track to become a substantial fertiliser player, backed by tectonic industry shifts that play into its K-Max hands, strong global exploration assets and a global food security elephant that refuses to leave the room.